Pete Buttigieg has moved up to third place in both New Hampshire and Iowa, according to three new polls! Please donate to help Mayor Pete keep the momentum going, and spread his message. He's an openly-gay millennial, a military vet who served in Afghanistan, and an unabashed liberal from a decidedly red state. Mayor Pete minces no words when taking on Republicans (here he is taking down Mike Pence), and he wants to be the Democratic nominee for president in 2020. We have a lot of great candidates for 2020, and I'd gladly support any of them against Donald Trump. 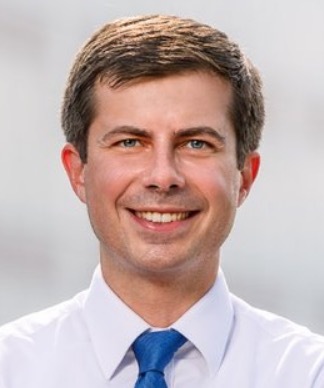 But there really is something special about Pete Buttigieg. If you listen to Pete, you'll be impressed by his ideas, his conviction, and his sincerity -- he's unlike any other candidate in the race today, and he's pretty unusual for politicians overall. I even compared him to Mr. Rogers on Joy Reid's show the other day! Pete is great on climate, guns, trade, foreign policy, health care, immigration and civil rights. President Obama even called Pete one of four Democrats who represent the future of the Democratic party. And Pete's message is catching on. He just qualified for the Democratic presidential debates, and he's in third place in both Iowa and New Hampshire. Also, with increased fundraising, Pete just opened offices in South Bend, New Hampshire and Iowa. Your donations have a real-world impact on the campaign. "Trump appeals to people’s smallness, their fears, whatever part of them wants to look backward. We need to generate a nationalism that does the harder task of political rhetoric, which is to make people feel big-hearted and secure." "The greatest nation in the world should not have much to fear from a family, especially children, fleeing violence. More importantly, children fleeing violence ought to have nothing to fear from the greatest country in the world." "We insist that being pro-minority and being pro-racial justice not only can but must be compatible with being pro-rule of law and respectful of law enforcement doing the right thing. It should enhance, not diminish, the value of a good police department when we assert what should go without saying but in these times must be said clearly and again and again — that black lives matter." "It is time to face the simple fact that capital punishment as seen in America has always been a discriminatory practice and we would be a fairer and safer country when we join the ranks of modern nations who have abolished the death penalty." As a gay man, I'm excited to see a serious LGBT candidate finally running for the presidency. Yet another glass ceiling is being broken. (Pete talks about that here.) But you don't have to be gay to be excited about Pete's candidacy. He's a smart, charismatic candidate that promises to bring honor, and even kindness, back to politics. He's the anti-Trump, and he's exactly what we need. Please donate now to help ensure that Mayor Pete Buttigieg can travel the country and get his message out. PS Here's another great video of Pete appearing on Morning Joe.